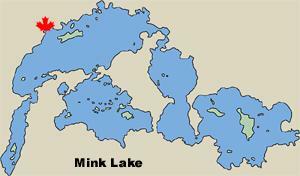 Mink Lake | Northern Wilderness Outfitters Ltd. 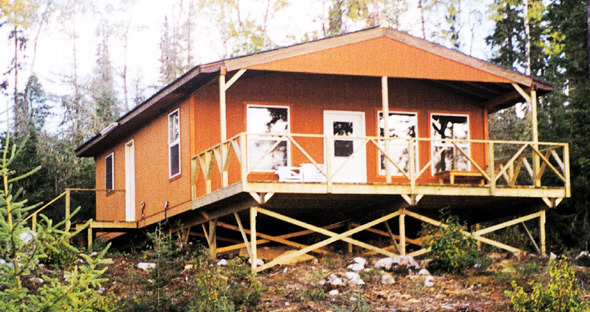 Located just north of Birch Lake, around 200 miles northwest of our airbase, we have a wilderness outpost cabin that can accommodate a party of 6 fishermen. The only cabin on Mink Lake has a large deck overlooking this fish-filled lake and is equipped with a hot shower, running hot and cold water, gas refrigerator, gas freezer, gas barbecue grill, gas fish cooker, living room and dining room furniture, solar lights, large mattresses, large 14’ boats with swivel padded boat seats, and other amenities to make your stay as comfortable as possible. With great wilderness accommodations and a lake that will give you some fast action fishing for walleyes and northerns, you know everyone will want to fish Mink Lake someday.